Located in Grand Rapids, MI, The Oaks at Cascade is the perfect destination for seniors seeking friendship, joy, and fulfillment. We’re senior living providers, but we’re also cheerleaders, foodies, storytellers, and professional motivators. In fact, we’re whatever our residents need us to be, whenever they need us. Our community is a place where seniors come to live, and it’s our job to ensure that they live life to the fullest. So if you’re looking for a place where luxury meets comfort, where activities abound, and where every stranger is just a friend you haven’t met, join us at The Oaks at Cascade. We can’t wait to meet you. We built The Oaks at Cascade on a foundation of family values: compassion, honesty, respect, and above all, service to others. For over 20 years, we’ve been connecting with people across the Midwest who share these values. Many of them have become Trilogy employees, and many more have become valued residents. We take pride in treating all of them like family. When you choose a Trilogy Senior Living Community, you can count on us to serve you according to our values, and to uphold those values with standards you can depend on. That’s The Trilogy Difference. You’ll feel it the moment you walk through our doors, and you’ll see it everywhere you look. It’s what makes every Trilogy Senior Living community a choice you can be proud of. We are committed to exceeding our customers' expectations. Excellence is achieved by execution of our Trilogy Service Standards. The right employees make the difference. A servant's heart is the key to success. The team approach works best. Communication ensures that Together Everyone Achieves More. The details separate the winners from the losers. Take what the company is doing very seriously, but not yourself. Our company has zero tolerance for egos or politics. 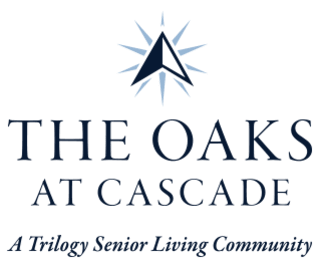 Schedule your personal tour of The Oaks at Cascade today!